Alpha Immuno Therapy (AIT) or Targeted Alpha Therapy (TAT) refers to the use of medicines conjugated with alpha particle emitting elements to target specific tissues. Advanced drug delivery technologies allow researchers to deliver molecules directly to cancer cells. Actinium-225 and Bismuth-213 are used in AIT However, both of these isotopes have low production yields and their production currently doesn’t match the scales of their consumption in medical processes. In numerical terms, it costs way much more per millicurie for long term sustainability of production. 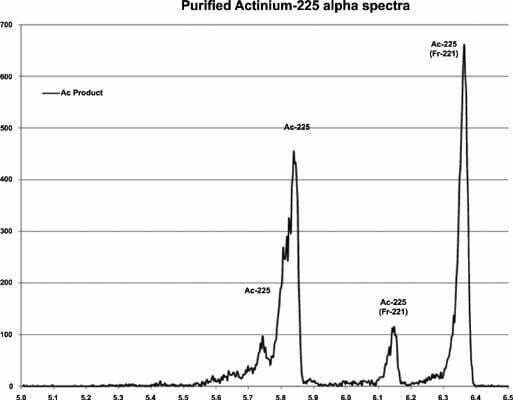 This review presented by James Harvey from Northstar Medical Technologies LLC – and published in Current Radiopharmaceuticals – shares information about useful techniques which can be employed for making Actinium-225 more sustainable in the long term. Harvey summarizes the importance of new techniques required to produce larger quantities of Actinium and presents the information about the leading producers of Actinium. This is followed by details of established and experimental methods of Actinium production.